But anywayyyy.... not so many things to do on day 5.. 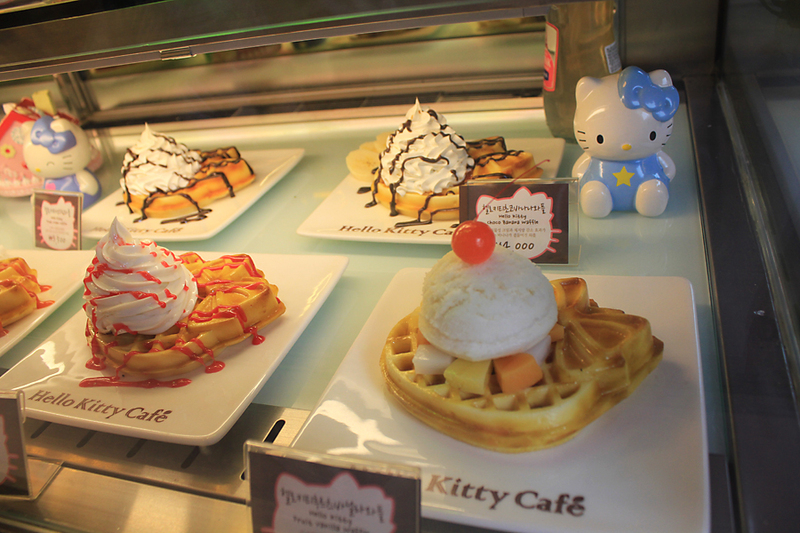 But best part is that I visited Hello Kitty Cafe in Hongdae, so let's take a look! But first Sophie and I visited Dongdaemun market first. really really not impressed with this market. It has 7 floors full of clothes and shoes and such but the price is about same with Mangga Dua, or even more expensive.. Also the sellers are mostly rude and they do not give discount.. I have learned "kkakka jusseoyo" or something like that to ask for discount, but then they scold me in korean "discount? you must be crazy", "just go die", "go away if you dont want to buy anything"
But first we had lunch! I forgot whether I bought any.. well, the fashion is frankly very boring.. Some are nice but ridiculously expensive for Korea standart imo. Because it's still made in China -_-" I'd rather go to china for shopping those stuffs la.. But at least, we spotted this Hello Kitty Cafe!!! So we decided to head back to hotel, but our hotel was quite near Lotte Mart.. Sophie wanted to buy Kimchi for friends, while I also wanted to buy some snacks and foods, so we decided to visit the market before headed back..
HK cafe udh Ada di Jakarta daerah PIK , Tp gak sebesar n selengkap itu stel..
Do u live in Apartment Grand Emerald, Klp Gading?